MITZPE RAMON, ISRAEL–This morning Will and I finished our work with the Zihor/Menuha boundary cobbles. We drove to the southern side of Makhtesh Ramon (pictured above) to see the same units we examined 25 kilometers to the north in Wadi Aqrav yesterday. The scenery was spectacular — and the day so hot that the wind felt like a hair-dryer in the face. Will standing on the very top of the Zihor Formation where it is overlain by the Menuha chalks. This picture was deliberately posed to give his parents a bit of a thrill. The Zihor/Menuha cobbles in the southern sections. They look very much like those we studied in Wadi Aqrav. They certainly are more numerous here and easy to measure. Some have borings by bivalves (Gastrochaenolites) and worms (Trypanites). We found no encrusters here, but we did find oyster shell fragments. 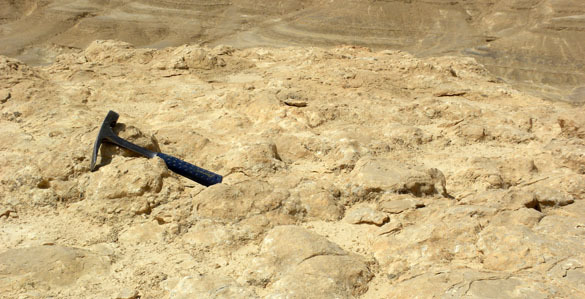 A difference between these southern exposures and those to the north is that the Zihor Formation top surface here is very well exposed. We can see that it was probably lithified during the erosion that created the disconformity and the cobble lag. It is undulating and well polished. Note that it is also on the edge of oblivion. This is the kind of shade we had in the field today — when we were lucky! It was 40°C by 1:00 p.m. Will is pressed up against an outcrop of the Menuha Formation, by the way, showing a sequence of carbonate nodules that may help explain the origin of the boundary cobbles. The Ora Formation: A future student project? 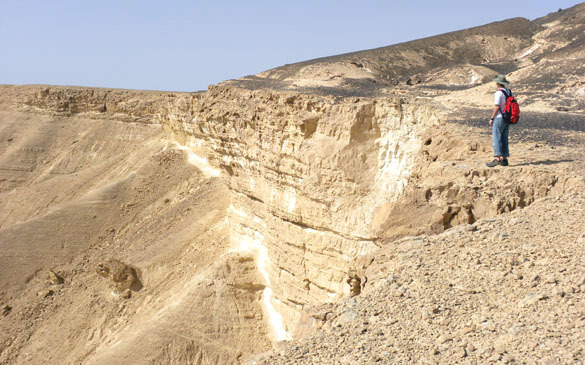 MITZPE RAMON, ISRAEL–I’ve always enjoyed seeing the Ora Formation, which is exposed only in Makhtesh Ramon and to the south. It is early Late Turonian in age, so it is part of the Upper Cretaceous and about 90 million years old. It has an astonishing range of depositional units, many of which Will and I saw today on our way to our localities. 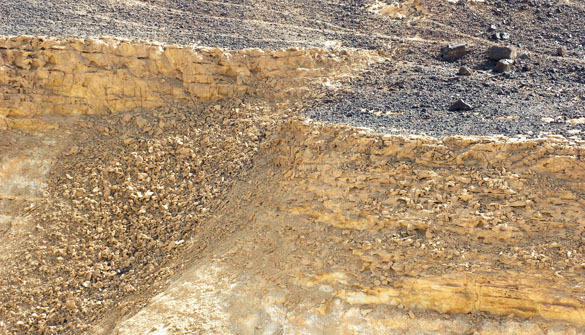 The Ora Formation has been very well studied by Israeli paleontologists and stratigraphers. Their work can now be expanded with more paleoecological analysis and some of the insights we’ve gained from new ideas about Calcite and Aragonite Sea alternations. Maybe another Wooster Independent Study project or two in the future? 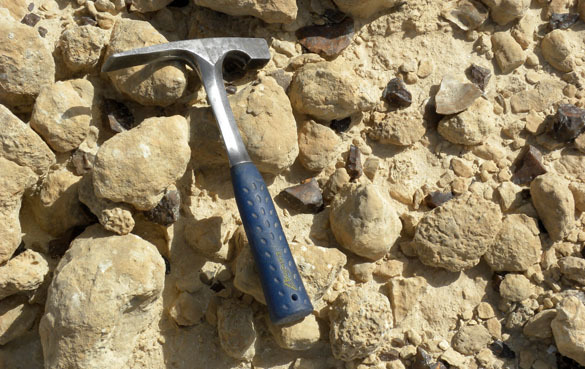 A carbonate hardground in the Ora Formation. 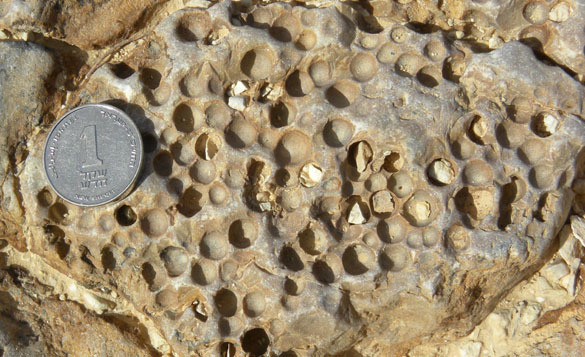 The holes were drilled by lithophagid bivalves, producing a trace fossil called Gastrochaenolites. These borings are very densely packed, which is more typical for the Jurassic than the Cretaceous. 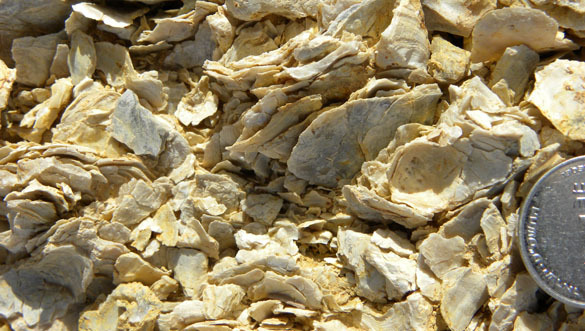 A unit composed of almost entirely oyster valves in the Ora Formation. It is above what is called locally the “Vroman Bank”. The shells are like large cornflakes. We didn’t get a chance to look in detail, but I’d love to see what kind of sclerobionts are preserved on these oysters. 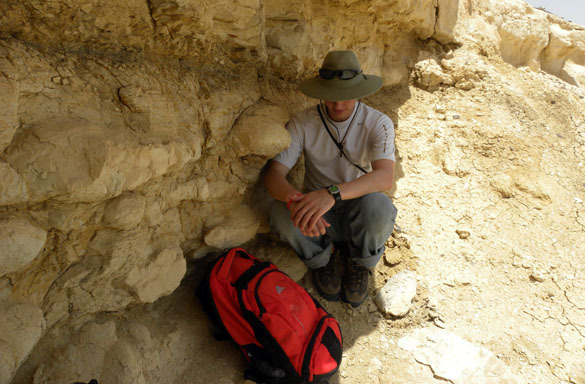 Will is sitting in an unusual diapiric structure in the Ora Formation. This is a dissected “mud volcano“, or at least what would have been a mud volcano but for the resistant capping rock. Soupy mud was forced out from underneath the overlying limestones forming an inverted cone in cross-section. The limestones dip into the structure because they were forced down by the accumulating mud. The criss-cross lines in the mud are planes of gypsum that intruded the sediments later. Note the blocks of limestone in the “throat” of the structure — this means the limestones were lithified during the event.